Since roughly January 2013, I’ve been playing games with a group at TAG. This once-a-week meetup eventually turned into Monday Night RPGs, where we rotate the gamemaster so that they only have to plan roughly every three weeks. Members of the group have come and gone (and will come again, darn it, for those of whom we are waiting to return from studying at NYU), but I’ve been playing games in this context for basically as long as I’ve been making video games (I’ve been playing tabletop RPGs since I was 16, or, in other words, as long as I’ve known my husband). Recently, it was brought to my attention that I might be learning something through all of that playing! For somebody who studies and makes games, I sure do have a hard time finding time to play them (especially video games), so the fact that these consistent play sessions have been there for me for so long is kind of a miracle, an oasis. Next Fall, Mia Consalvo will be teaching a class called Player Studies, which I think I’ll be taking. With that future class in mind, I thought it might be worth considering what I learn from playing and participating in these sessions. I’ve always believed that doing a lot of reading is one way to get better at writing, although being a voracious reader doesn’t automatically make you a good writer. In the same way, playing games hopefully makes me a better game designer. Of course I can identify trends in playstyles and behaviour from my group — we’ve been playing together in the same context for three years (and playing together since I was 16 for some the people in this circle). For now, I don’t want to retroactively make sweeping observations about past sessions. I wasn’t thinking along these lines during those sessions, so this is something to consider for the future, when I have the opportunity or notice something of interest. Another upshoot of this was that I didn’t get as much of a chance to playtest other people’s work, but, at least for Curious Games studio, I know that there’ll be an effort to put all of the games online, and I’ll be sure to post them here, and I’ll have other opportunities to playtest my fellow Crit-Hitters’ (hey, how’s that for a group name, TAGsters?) games. What I did get to playtest was all a super-effective use of our eight weeks of class-time: a creepy home invasion game with a sinister ending (this is a pun about fire – all the internet points if you kind of get it although it’s not a very good pun), a game where you just can’t win with your high-maintenance significant other and a game where your job as the game’s camera is to keep Sir Capsule alive by properly panning around and alerting him to dangers ahead (Capsule being the default sprite in Unity if you don’t create a model). There were two major physical problems that I didn’t anticipate during the playtest. One is something that would only ever occur if it was necessary to play the game in a room full of people: it’s really annoying and almost impossible to put headphones on over a scuba diving mask. A solution might have been to use earbuds, but in my experience (at Pixelles when I forgot to bring headphones), people are reluctant to share earbuds, and probably rightly so. The other is very simple, and something that should have occurred to me since I wear them half the time myself: glasses. Scuba diving masks and glasses. When I mentioned it to Pippin, he said basically that it was another opportunity for something funny to happen: people having to lean in close to their screens to play. Maybe. I can’t really think of another solution. I have the option of wearing contacts that I usually carry with me, so it didn’t occur to me, although maybe it’s not a problem I would have been able to fix even if I had thought about it ahead of time. From a programming perspective, I noticed a bug when playing the game through multiple times: the air sometimes doesn’t reset to its original levels and I noticed that people had a lot of trouble with accidentally clicking on the whistle instead of the piece that they wanted and that they usually seemed to forget entirely about being able to move the perspective around using the arrow keys. The whistle thing was intentional, although I disliked that it interrupted the gameplay and might try to do something like make it even smaller or put it someplace where the player is unlikely to click it by accident. People seemed to mostly enjoy the novelty of the equipment and sort of marvelled at the difficulty of playing the game in the equipment compared to without. I should add that using the particular mac mouse that we playtested with was plenty difficult without gloves as well. Something that I wasn’t altogether satisfied with but that I think is overall unavoidable is that I found the process of getting on the equipment and the process of adjusting the mask sizes to be slow and cumbersome to the process of playing the game. Honestly, it does mimic reality: getting equipment on and off is something that divers have to deal with and we all have our rituals of what goes on first, what goes on last, and everything in between. But I hadn’t intended for the equipment process itself to be a part of the game because I only really needed the difficulty to be part of the gameplay. I watched about six pairs of people play the game. I was again struck by the way that the interaction between the two players is really what makes the game – the experience of playing together and laughing together was wonderful to watch. I also got to think more about my own design and how I seemed to have unconsciously embedded more aspects of nitrogen narcosis than I had thought: for example, it’s possible to play five games of tic-tac-toe throughout the game (or more if you run into extra time and Player 2 is willing to drag around Player 1’s ‘O’s for him to the right spot and not cheat…) and tic-tac-toe is a simple enough game that that’s arguably pretty repetitive. As I watched people play yesterday, I remembered a story that I had heard about a diver whose responsibility it was to tie a line to a wreck. He wasn’t able to tie the knot properly and someone else took over for him. Later on, at depth, he found an end of rope that wasn’t tied to anything, and, being narc’d, he started to repeatedly tie knots in it, as if trying to fulfill his earlier responsibility. He would have done that until he ran out of air had his buddy not noticed and brought him up (it’s my understanding that the knot-tying diver was actually violent in his desire not to stop his work). I’d say that out of the six playthroughs that I saw, in four cases both players seemed to really like it, in one playthrough the players seemed a little mystified, and in one case the equipment seemed to interfere with the enjoyment of the game. What seemed the most successful overall was the interaction between programming and the physical world – how what someone was wearing in the physical world affected what they were able to do in the programmed space. That’s pretty cool. For this playtest, I was specifically trying to see how people felt about our two gameplay mechanics: the ideograms (if they were communicating properly and were fairly easy to interpret) and the block puzzles (specifically: how people felt about them and their relationship to the body that they created). The answer for the ideograms is a resounding yes: people almost always got the sense of what they were supposed to mean without any help (although there may be a slight learning curve to learning the “language” of our particular ideograms), and what’s more, they really enjoyed them. I think that it would not be difficult to expand our ideogram “vocabulary” as much as we want, because all that’s involved is drawing a 2-D ideogram with no frills – just an outline, really. When the ideograms weren’t clear, people sometimes chose them because they enjoyed their ambiguity. The answer for the puzzles is unsurprisingly complex, and it revealed a great deal of complexity in regard’s to people’s thoughts about body image. I provided written instructions to the players and then tried to step back (although most people didn’t really read them and I ended up explaining things that were on the sheet every time anyhow – I don’t mind, it gave me a chance to interact with the playtesters). So, as I mentioned, the ideograms really seemed to work. Where things get much more difficult is in the matter of the block puzzles. As a mechanic for sorting out which body parts the player got, the block puzzle seems to work well metaphorically. Where things get more complicated is in terms of which body parts are included in the puzzles. One person noted that she would have chosen Rosie’s body parts except that she didn’t want to have tattoos (Rosie’s body has tattoos because of her backstory) – she didn’t like tattoos and didn’t feel that they properly represented what she wanted. That’s really interesting because it points to stigma that we didn’t consider: it’s true that there are still some people who feel strangely about tattoos – especially, for example, in a professional workplace (although I’m under the impression that this is less of a problem than it used to be, I really don’t know). On the other hand, this is a game about being pressured to make choices that the player doesn’t necessarily want to make – in terms of what their body should look like and what career they will end up in. This same player felt that we should include more varieties of body part (maybe we can vary them between the puzzles, because we do have a limitation for the number of blocks that we can include in the puzzle). She also suggested throwing in one other accessory to help narrow down the character’s role – something that the player gets to choose. In terms of blocks, we do have two pairs of skinny arms (that was to increase the likelihood that the player would feel the need of choosing a skinny block) and we could change one for something else, but we really have to think about what that choice would mean. Personally, I don’t want players to dislike the body that they end up with – I think that the reframing of the body will only happen when they interact with other zombies – which, for the playtest, were simulated by the crowd of people and the ideograms – and people were allowed to choose whatever ideogram they wanted. In the context of the game, the zombies will be choosing from a more limited set based on what body parts come out and what “stereotype” object the player has. 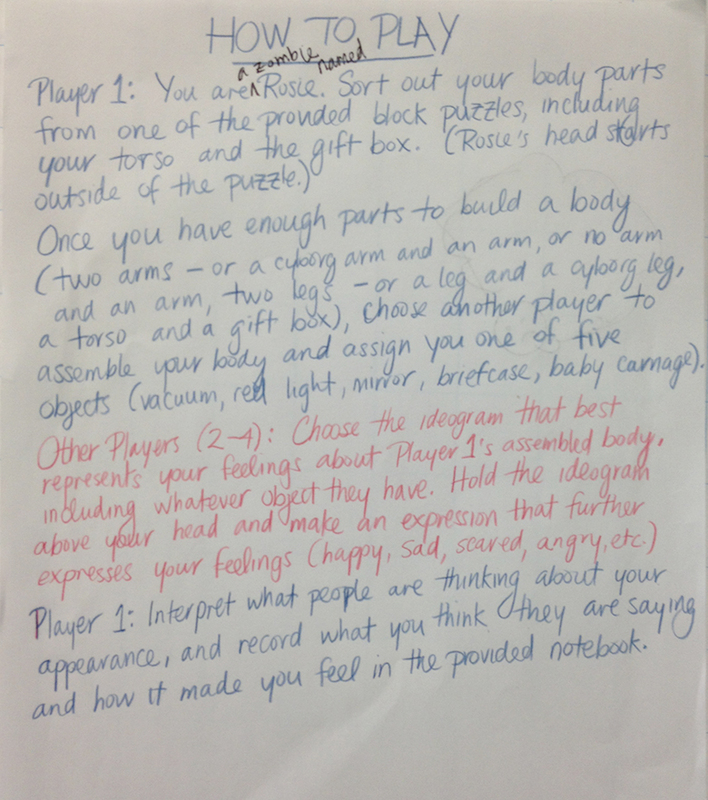 Similarly, the “stereotype” object is represented in the paper prototype by a small gift box (I felt that it was a waste of resources to make a mini-version of each object for inclusion in the puzzle), and I had whoever the player chose as their assembler assign them whatever object that they want. In the game, we want the player to experience each of the five stereotypes one by one. I think that forcing the player to take out the objects from the puzzle in a specific order (say, legs first, then arms, then torso, then “present”) might help constrain people’s choices in the puzzle while creating more of a sense of difficulty, since, as it has been pointed out, people can just take out any body part opportunistically right now. I don’t know how difficult that would be but it would make sense if the body were being built from the ground up. I’ve got a lot to think about! Thanks to everyone who came out to the playtest and thanks to the Curious Games Studio students and the Critical Hit participants for sharing their games.